Back with a brand new interview on WahaWatches. It’s my pleasure to introduce Justin Vrakas. Justin is the founder & owner of Watchsteez and he’s also a member of the National Association of Watch & Clock Collectors. Watchsteez is an online shop focusing on chronographs and tool watches. Recently, he started collaborating with Analog/Shift. Every vintage watch comes with its own story. My family is in the jewelry business and my great grandfather was a highly-skilled watchmaker, so I’ve always been fascinated with watches. I ended up inheriting his Universal Genève Polerouter Automatic (he had good taste). Ironically the watch needed repair, but that sparked my interest in vintage mechanical wristwatches and ultimately led to two semesters of watchmaking courses at Milwaukee Area Technical College. I’m always on the hunt for the next piece, which is exciting and keeps me on my toes. I’m very passionate about history, so vintage watches are a unique way for me to get a glimpse into bygone eras. Quality examples have also proven to be good investments. It comes as no surprise that my collection is almost entirely made up of vintage wristwatches with the exception of two or three select pieces (I have to always own at least one watch that I can take into water). Most of my vintage pieces are chronographs from the 1950s through the 1970s, but I also have some cool dive watches and watches with other interesting complications (i.e. alarm, day/night indicator, regatta countdown, moonphase, etc.). My vintage stainless steel Movado Sub-Sea M95 Chronograph with “panda” tachymeter dial is currently getting the most wrist time. I just love the size and balance of the watch and it wears so well on my wrist. I believe that these are currently undervalued, but probably won’t be for long. 1. Gallet MultiChron 45M Yachting, second series (large size with “waterproof” stainless steel case and pump pushers). Gallet introduced the MultiChron Yachting in 1945 and it was the very first wrist chronograph with a regatta countdown timer for yacht racing. They produced several variations of the watch but made very little specimens of each. I prefer the model with art-deco numerals and no text on the dial at 12 o’clock. This watch was way ahead of its time in regard to technology, function, and design. 2. Rolex Daytona ref. 6263 “Big Red” Chronograph (stainless steel with silver dial with black sub-registers). It would be hard to improve this watch from an aesthetic standpoint. The size is perfect with the screw-down pushers. And for me, it doesn’t get much better than a 6263. 3. Mido Powerwind Diver 1,000 Ft. with exotic decompression dial. According to original Mido literature, this deep diver watch and decompression timer was developed by Mido in cooperation with world-famous skin diving authority D. L. Jayet. It is self-winding and waterproof to 1,000 feet. The vibrant and colorful dial is unlike any other and really grabs your attention when you see it. The “Holy Grail” for me and my absolute end-game watch is the Heuer Carrera Skipper ref. 7754 (also known as the “Skipperrera”). It’s unbelievably rare (less than 15 examples are known) and I can safely say that it’s the coolest watch that I’ve ever seen or handled in person. It has a stunning blue/purple dial with a colorful yachting sub-register and red chronograph seconds hand all in a classic Carrera case. The 1960s Carrera case is one of the best cases ever made in my opinion and it was designed by Jack Heuer himself. I may never have the opportunity to own one of these, but I can at least dream! 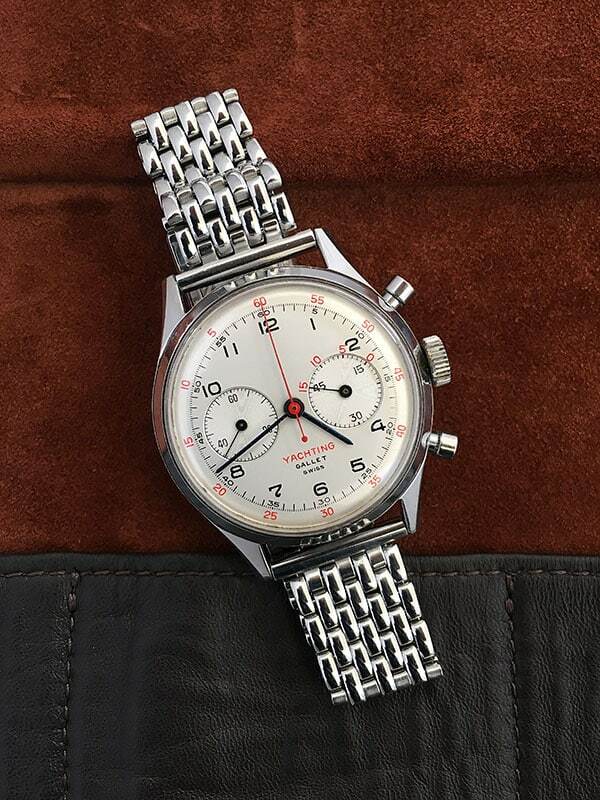 I’m still looking for the right example of a 1960s Heuer Carrera ref. 2447N (black dial) three-register chronograph with Valjoux 72 movement. I’d prefer to own a first execution in a perfect world, but beggars can’t be choosers. I wish I’d have purchased more vintage watches when prices were relatively low, but don’t we all wish we had a time machine? I passed on several nice examples of the Heuer Carrera ref. 2447N (mentioned above) when prices were seemingly out of control, but now those old prices seem like a steal! Mido Powerwind Diver 1,000 Ft. There are several brands that I believe are still undervalued and present tremendous upside: Gallet and Movado immediately come to mind. There are also some relatively unknown brands, that produced some really cool watches back in the day, which are currently making a push in the vintage marketplace. I’d put vintage Bulova, LeJour, Nivada Grenchen, etc. in that category. In the end, I feel that a superb example of any desirable vintage watch will continue to rise in value over time. Always go with quality over quantity. It’s better to own a select few quality pieces in top condition than a bunch of average pieces. Follow Justin on Instagram for pictures of his amazing collection and to see Watchsteez evolving. Head over to wahawatches.com to read my latest interview with Melvin Hollenberg – No surprise that the 6263 made my “top 3” ?